CHENNAI. NOV.13. 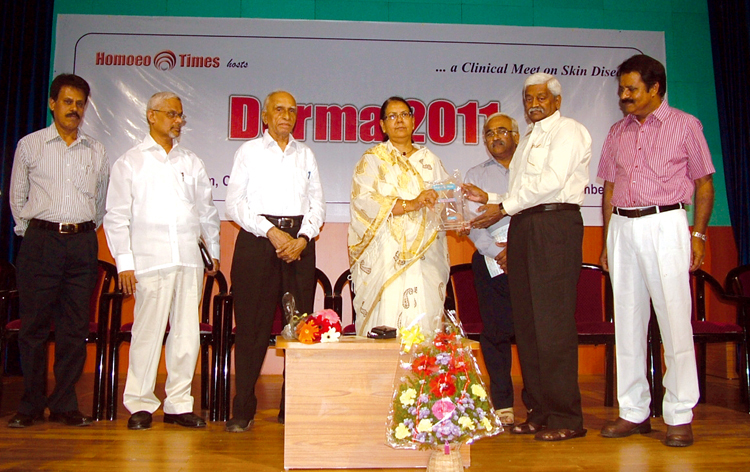 Homoeo Times organized a clinical Meet on skin disease DERMA 2011 at Muthamizhil Mandram. G.Ramya welcomed the gathering. Tmt Qudsia Gandhi, Additional Chief Secretary, TN, Finance Power Corporation was the Chief Guest to the occasion. She inaugurated the CME by lighting the kuthuvizhakku. Dr.N.Subramanian, Advisor, Hahnemann Homoeopathy Medical College garlanded Hahnemann’s bust and floral tributes paid by Dr.K.S.Srinivasan, Dr.A.S.Manickavel, Dr.P.Subramanium, Dr.A.Thamaraiselvan, Dr. Mohamed Aleem, Dr.Kumaresan, Dr. M.R.Srivatasan, Dr. Veerabramhachary and Dr. Mohanasundaram.